1. So Nikki, you are joining Datamaran fresh from your role as Director of Corporate & Stakeholder Relations at the Global Reporting Initiative (GRI), what was your reason for joining Datamaran? I have been watching my ex-colleague Marjella Alma (CEO, Datamaran) for the past few years with admiration. I share her entrepreneurial spirit and this is a great time to join Datamaran. In my role as Director of Marketing & Partnerships I will be helping set the strategy for substantial business growth. That combined with my personal passion for sustainability and changing corporate behaviour made it a fantastic opportunity. Well in some ways yes, as it's a switch from non-profit to a small fast-paced commercial environment. But my background is actually inside corporations and in marketing, so I am back to my roots there. At GRI I had the privilege of working with an extensive global network of leading global standard-setters, consultants and corporates; within that, especially with Heads of Sustainability at hundreds of leading national and multi-national companies, which I will continue to work with. It's an extremely challenging role to try and influence corporate behaviour within a company, and I have always wanted to provide them with as much support as possible. Data speaks volumes, and I find Datamaran a very practical solution. 3. What are the plans for 2018? We have big plans already! This company moves quickly! 2018 will bring more applied uses for Datamaran, starting with a springtime leap to support companies with stronger, innovative ways to identify their most material ESG risks. There is both confusion (where do I start?) and complacency (we do it this way every 2 years) around the classic materiality process. We plan to shake things up a little and provide solutions to remove the pain from lengthy, manual, subjective materiality processes. 4. Why are you excited about the combination of AI and ESG risk management? Oh! Well I have to confess that I have previously been quite a technophobe. There is no room for that kind of attitude in today's world. Technology is supportive of such rapid change, for good, I have had to open up my mind there. Frankly there is nothing so satisfying as seeing AI do a mountain of work for you that you couldn't wish to accomplish yourself. It is all about seeing technology as a way to support the end goal, and I am extremely passionate about sustainable business, especially as it helps us create a fair and just world. I am happy to use all the tools available to get there. 5. Who will you be watching for inspiration this year in this space? Well, actually I think I will mostly be looking beyond the sustainability space. Many of the most inspiring stories are coming from entrepreneurs with a social mindset simply getting on and creating solutions for pressing problems. I get a lot of energy from seeing that. Also, Datamaran has a wide network in C-suite, risk professionals and the mainstream press; it's great to see those folks at the table as it means businesses no longer treat these topics as optional. 6. What do you think you will personally bring to Datamaran? I have 15 years experience across very different types of organization and in varied roles. At Computershare I learned the business basics in market identification, product development. At Nationwide, I got a grounding in all things marketing. At TreeAID I learned how to apply some ingenuity to a shoe-string budget and go back in touch with my social sustainability passion. Along the way I formalized my marketing & business training with an MA which also built my CSR expertise. At GRI I learned the sustainability scene inside and out. I built programs, teams, revenues and got a wonderfully diverse regional perspective through my work with local offices. The stage Datamaran is now is that it needs to shed light on all accomplishments to date; it already has a global clientele of happy blue-chip companies. I plan to bring my energy, creativity and experience to scale the company and help it grow strategically. 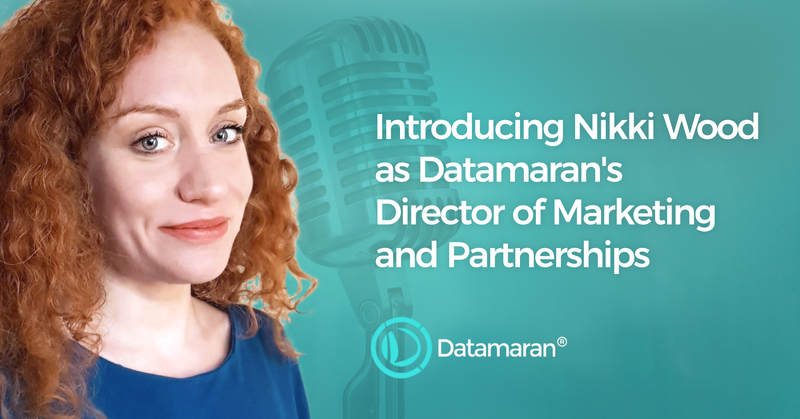 We're delighted Nikki has joined Datamaran, and we look forward to working with her in the future!